marks the Medlock/Scott Blvd./N. Decatur Rd intersection. Click to enlarge. On July 19, 2016, the DeKalb County's Board of Commissioners adopted the Medline LCI study with amendments to address concerns voiced by the community. In 2013, Commissioners Rader and Gannon's Medline Livable Communities Initiative study was funded by the Atlanta Regional Commission. The purpose: to develop a vision to guide future development of the area. The study was conducted by the Sizemore Group and was presented to the Community in June 2014. 1) Our residential areas require appropriate, generous setbacks and clearly defined medium density. The Medline Study “encouraged high density mixed use development in the center of the study area, with medium density residential at the periphery, as a transitional buffer into the surrounding single family neighborhood" (p 102) while the actual zoning overlay map page 103 shows high density in the majority of the study area, often with no medium density between it and R-75 properties. The proposal also fails to include any recommended setbacks from residential property. 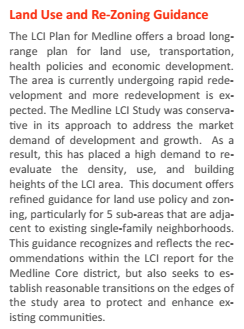 2) Clearly defined medium density is appropriate for the area; high density “up to 14 floor” developments are not healthy for established residential neighborhoods and set a worrisome precedent for homeowners within and beyond the Medline LCI. 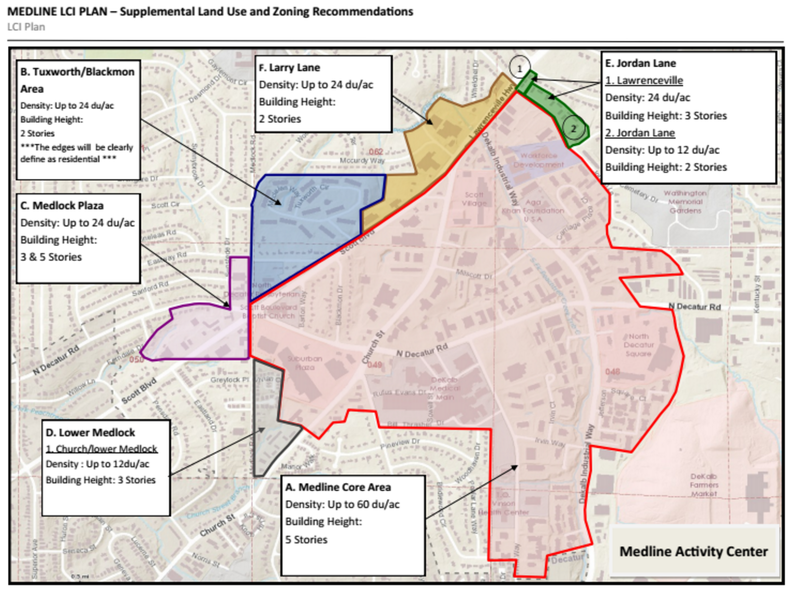 Since high density is defined as "15-30 units/acre allowing up to 14 floors" per the marked-up map below, this means, for example, that our neighbors on McCurdy could have 14 story buildings in their backyard and they would have no grounds on which to oppose it. This is also true for all the cul-de- sacs coming off the east side of Woodridge, some of Woodridge, Blackmon Drive, some of Medlock Road, Eastway, Sunstede (as the Woodshed and Melton's lots are also zoned for high density). This is also true of the streets in Springdale Heights, Decatur Heights and others. Annotated Figure 4w from the Medline LCI created by Jim Smith [CHCA]. 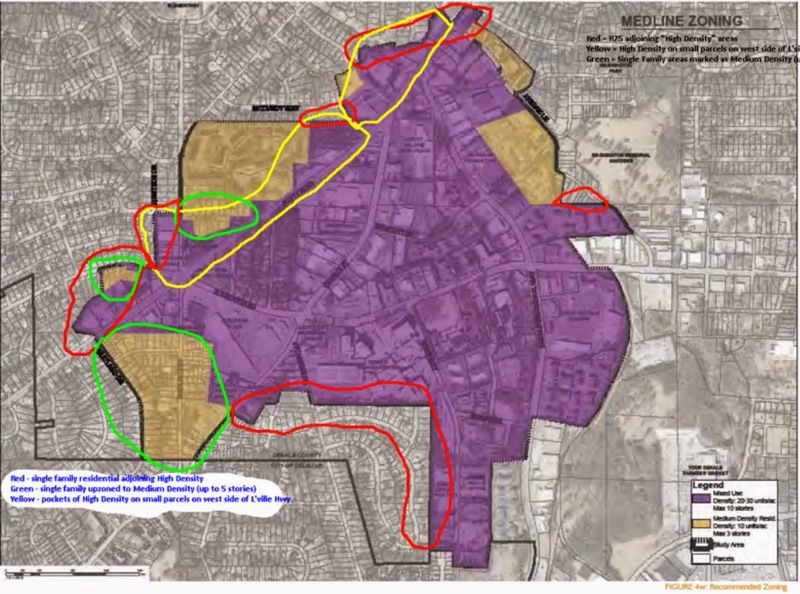 Red outlines mark single family residential properties adjoining high density; green areas denote single family residential properties up-zoned to medium density (up to 5 stories high); yellow denotes pockets of high density on small parcels on the west side of Lawrenceville Highway. Click to enlarge. At that time, we presented the map above to illustrate all the areas we identified as needing transitional buffers to ensure density stopping points and protect the integrity of our established single family neighborhoods. We felt strongly that supporting the redevelopment of the Medline could be done without jeopardizing our residential communities. 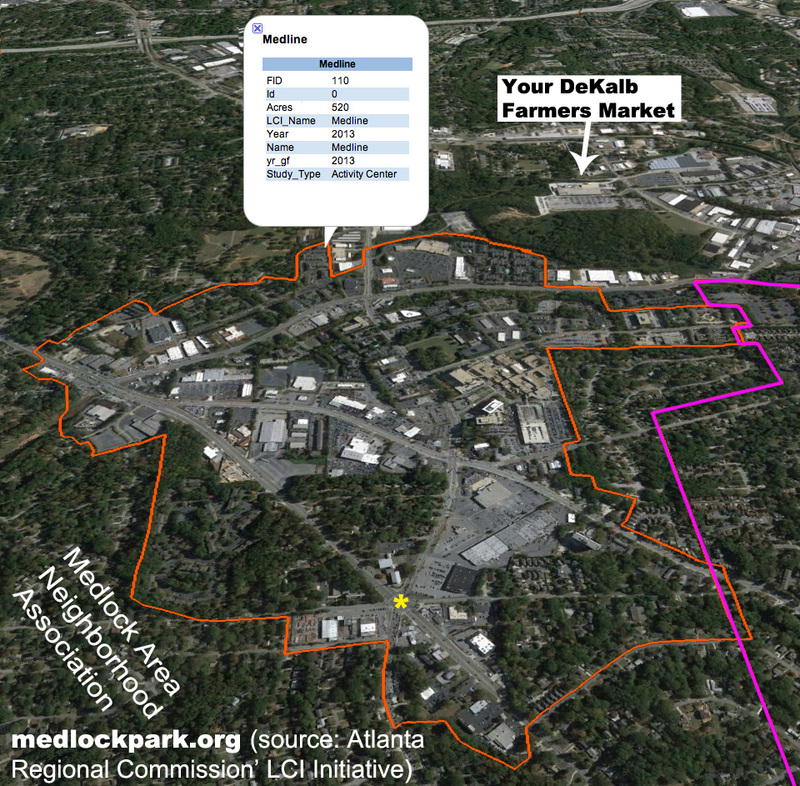 With the support of the Medlock Area Neighborhood Association and the Dekalb Cross-Neighborhoods Council, the Board of Commissioners passed a resolution on July 19, 2016 to adopt the Medline Regional Activity Center LCI Study and to amend the Dekalb Comprehensive Plan with Supplemental Plan Section 5.7 (Supplemental Land Use and Zoning Recommendations). The Medline LCI, as officially adopted. Notice slight differences from the original plan seen in the preceding map. 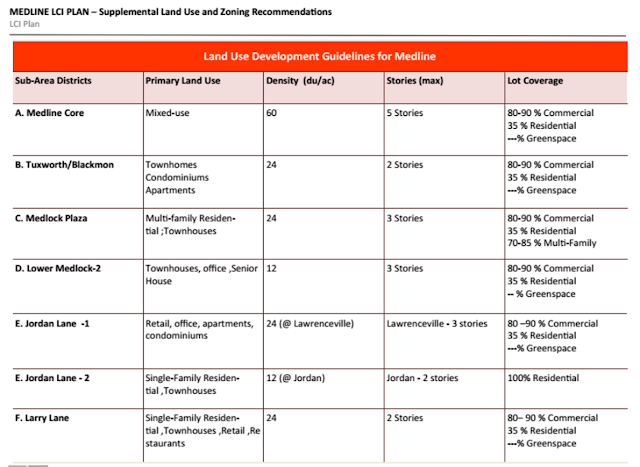 The approved Supplemental Land Use and Zoning Recommendations override the land use and zoning recommendations in the original Medline LCI Study. The supplement was negotiated to address the concerns of the community about the lack of transitional buffers between high density and the adjacent single family neighborhoods (with R-75 zoning). The Original Medline LCI study is available here [pdf, 144 pages]. 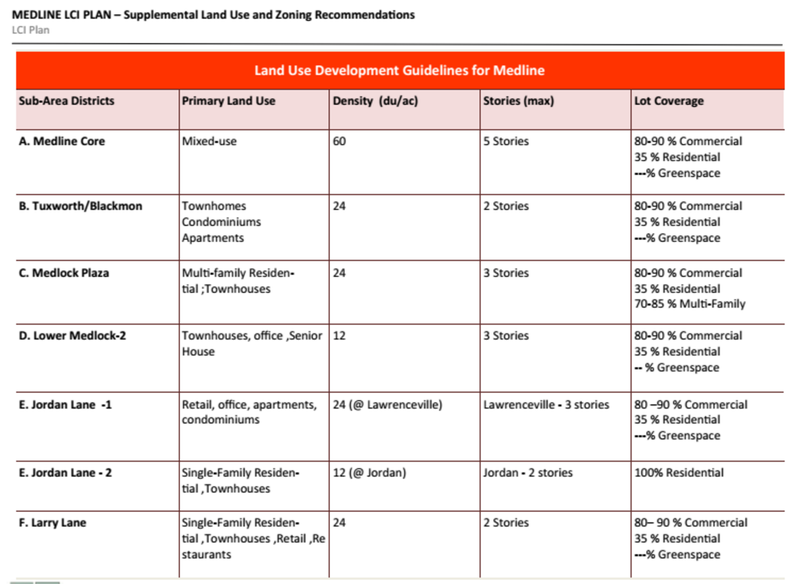 The Supplemental Land Use and Zoning Recommendations are available here [pdf, 32 pages]. This file includes an executive summary for Medline LCI as well as the resolution to adopt the study with amendments. Highlights of amended zoning and density recommendations follow. Page 5 outlines density limits for areas abutting established neighborhoods. Page 6 spells out the details for redevelopment along the named residential districts. 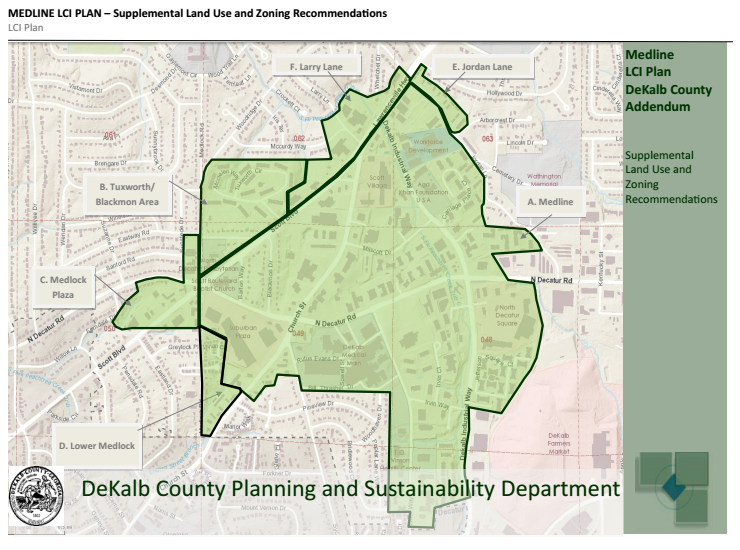 After nearly 2 years of collaboration with Davis Fox (Policy and Projects Manager for Kathie Gannon County Commissioner for Super District 6) and Larry Washington, (Senior Planner, Long Range Planning Dekalb County Department of Planning & Sustainability) we were able agree on the approved supplemented map. We feel it adequately addresses our concerns - keeping the dense development concentrated at the core with transitional buffers to protect the adjacent neighborhoods. 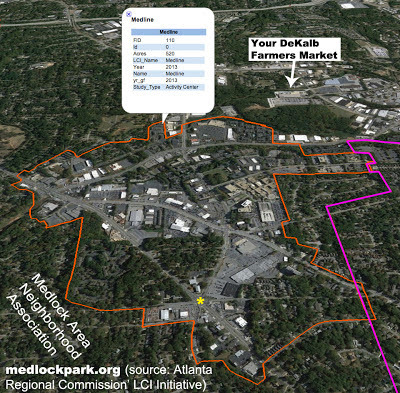 The Medlock Plaza Area (including what is currently The Woodshed) was the most difficult area to reconcile. It may be noted that the height approved for the Medlock Plaza lot ranges from 3-5 stories. Though there are currently no plans to redevelop this corner, the County feels it would be appropriate for the frontage on N. Decatur Road to match that of the apartments across the street. The height would then have to transition to 3 stories and be compatible with the homes across the street on Sunstede Drive and Eastway Road. The new code has a differential height plane that will have to be observed. 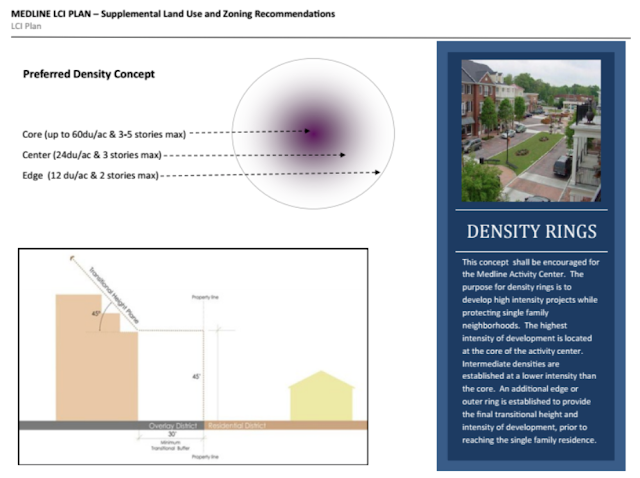 Page 4 illustrates the "step down" from higher density to single-family areas. Additionally, the community would have an active role in redevelopment of this property through the rezoning process.This supplement will serve as a blueprint for development that will be allowed in our area - especially as it pertains to the maximum heights and density that will be permitted.